At stalls 31-32 of the municipal market of Vallehermoso, Madrid, one of the direct points of sale of Cuerda Larga – Carnes de Miraflores is found, whose counter and coverings are made with the compact mineral from PORCELANOSA Group, KRION. 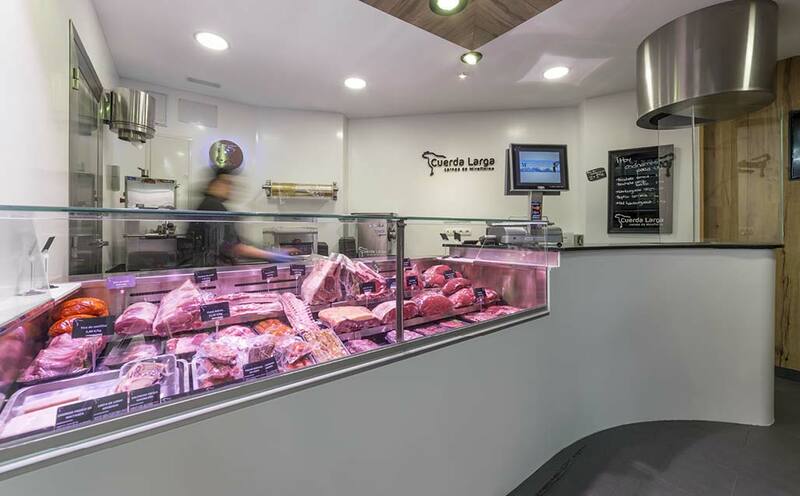 Cuerda Larga – Carnes de Miraflores is a breeder and producer of Friesian beef, and one of its main business areas is direct to home sales of fresh meat without intermediaries, with over 30 years of experience with livestock in Miraflores de la Sierra, Madrid. We can find the solid surface KRION, in its 1100 Snow White colour, transformed into a countertop, curve and wall covering. Due to its easy cleaning, additive-free antibacterial property and resistance to chemical products, it was selected by Cuerda Larga and the KRION transforming company Muebles Maderama for this establishment.